A little over a dozen universal apps (also known as Metro or Modern apps) are bundled with Windows 10. Calculator, Calendar, Mail, Camera, Cortana, Contact Support, File & TV, Get Started, Groove Music, Maps, News, OneNote, People, Photos, and Phone Companion are some of the apps that ship with Windows 10. While it’s true that most of these apps were part of the previous version of Windows as well and were not impressive, all these apps have been updated with better UI and features. Some of these apps like Mail, Calendar, Calculator and Voice Recorder are really helpful, but not all users are going to use these default apps. That said, uninstalling these default apps is not a good idea, especially if you hope to free up some disk space. Some of these apps are under 1 MB, in fact, uninstalling all these apps will probably free up around 100 MB of disk space. 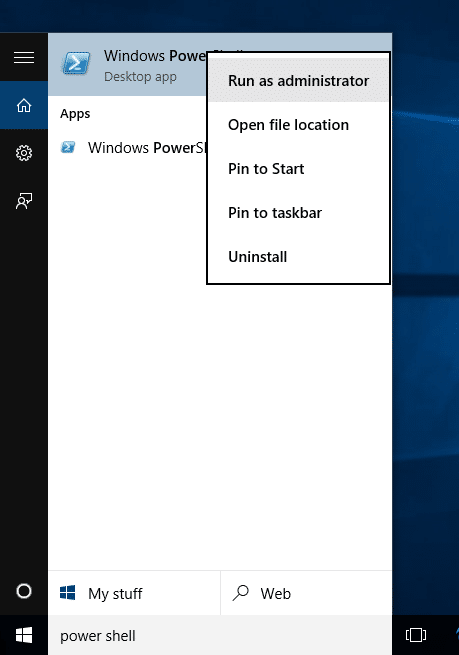 Moreover, if you want to uninstall one or more default apps in Windows 10, it’s not possible to do so via the Control Panel or Settings app. As with the case of traditional Windows programs like Paint and Notepad, with default settings, Windows 10 doesn’t allow you uninstall or remove these default apps. The Apps and features section of Settings app doesn’t show Uninstall option when you click on a default app. NOTE: Some of the apps like Cortana and Store can’t be uninstalled as they are system apps and essential for the smooth operation of Windows 10. Step 1: The first step is to open Windows PowerShell as administrator. To do so, type PowerShell in the Start menu or taskbar search box to see PowerShell in the search results, right-click on it and then click Run as administrator. Alternatively, type PowerShell in search box and then simultaneously press Ctrl + Shift + Enter keys to run it as administrator. 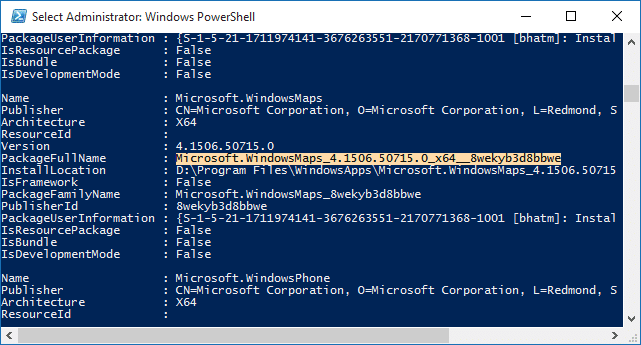 Step 2: In the PowerShell window, type the following command and then press Enter key to get a list of all default apps and universal apps installed from the Store. Step 3: Scroll down to see the app that you want to uninstall. And if you want to uninstall all apps at once, please skip to Step 6. Copy the package name of the application as we can’t uninstall an app by just entering its name. The package name appears right next to PackageFullName. For instance, in this guide, we are uninstalling the Maps app. To do so, we need to first copy the full package name of the app. To copy the full package name, select the full package name as shown in the above picture, and then use Ctrl + C hotkey to copy the name. 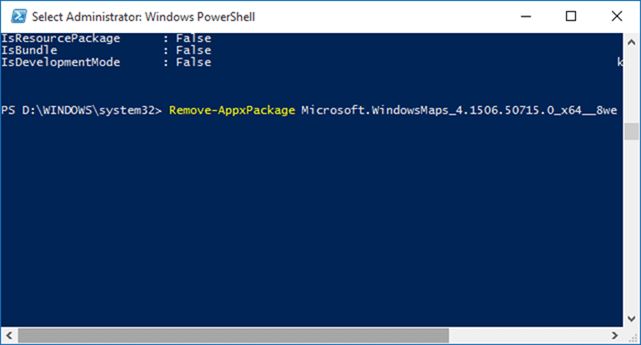 In the above command replace PackageFullName with the full package name of the app. In this guide, we are removing the Maps app. So we have put the full package name of Maps app. Step 5: To remove all default apps from all user accounts, use the following command. In the above command replace the User with your user name. Use this code to remove for all users and users you will create in the future and to avoid them from re-installing themselves. I think Microsoft have wised to the uninstall trick and disabled the ‘get’ command. Enough is enough do I go Linux or Apple? I used both the power shell and that program ( btw the 1.2 shows a virus when I tried to down load it 1.0 was ok ) to remove some of the apps. but when I go to the power shell it still shows everything but they are gone from start menu. So does this just remove them from the start menu only???? Could you post the error here? Ever since I upgraded to Windows 10, both my Calendar and Mail apps were crashing every time I tried opening them. This tutorial helped me manually uninstall these programs. After reinstalling both from the Microsoft Store, they are working perfectly! Thanks! This did not work for me as well. I even elevated ExecutionPolicy to unrestricted, but to no avail. I get the confirmation dialog box, which I respond Y, but no error message and the package remains. Any insight would be appreciated. This will work for the current logged-in user, but not for any other user that may log in to the device. I previously tried to uninstall the weather app from Build 10240 using Powershell, but it failed. Could be that Microsoft has locked down their core preinstalled apps (none of which I use, by the way), or it could be that there are still apps and features broken in this latest install on my test computer. I’m doing a reset of it right now, and will once again attempt to use Powershell to uninstall these unneeded apps. I hope it works better next time around.